Welcome to the community of Sahalee on the Sammamish Plateau. The Sahalee Country Club is a private golf course and country club in Sammamish, Washington, a suburb east of Seattle. In the Chinookan language, Sahalee means "high heavenly ground." 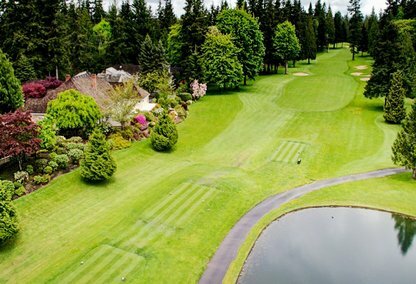 The 27-hole course is located on a heavily forested plateau immediately east of Lake Sammamish. This enclave is a highly desirable area for home owners due to it's secluded nature and private gated community. Coveted rambler in the gated golf course community of Sahalee. Immaculate bright kitchen with gourmet stainless steel appliances and an abundance of counter space and cabinets that will surely please. Custom built-in cabinetry throughout the home. This ? acre private lot has a park like setting and an expansive deck that allows for endless outdoor entertaining. Lake Washington School District along with quick commute into Redmond and Bellevue. Incomparable Sahalee Awaits!!! Set amongst the tall evergreens of Sahalee Country Club lies an incredible opportunity. This beautiful 3 bedroom home offers all you'd expect from Sahalee without the million dollar price tag. 2 baths, upgraded kitchen, hardwood floors, fantastic patio entertaining area, and additional parking complete the picture. Proudly offered to market at $724,990. Treasured Ketcha Village townhome in the coveted, gated Sahalee Country Club community. End unit w/ 3 bed, 2.25 bath and main floor den/office. New energy efficient windows, lighting, carpet, doors/millwork, paint, gas fireplace and 50 year roof (2013). HOA dues are all inclusive of street maintenance, gated 24 hour security, yard maintenance, roof/siding/structure, building insurance and water/sewer. Tremendous Sammamish Plateau value! Spectacular Lake Sammamish View Property! Possible 15 lot subdivision on the 4.51 acre site. Water and sewer are at the road and are available. Streets and Utilities on two sides of the property. Several preliminary engineer's site plans . Two existing homes. Value in land. City of Sammamish jurisdiction. A highly sought-after residential re-development opportunity on 228th Ave SE in Sammamish! Approx. 1.22 acres of flat land currently zoned R8 in the Redhawk neighborhood with sidewalks in place and utilities at the property. Located one block from Skyline High School and minutes from Downtown Sammamish, this property is unlike anything else currently on the market in this area! Buyer to verify its desired land use with the City of Sammamish. APPROVED 7-lot subdivision in Sammamish. ~2 acres zoned R-4. Unbeatable location surrounded by $1M+ homes, adjacent to Discovery Elementary, a quick stroll to Pine Lake Park. Bring your vision! Preliminary short plat has been approved by the City of Sammamish - ready for construction permit app. Please respect tenant's privacy. Truly custom luxury House on sitting on 2.4 beautiful private acres. 2 story stone fireplace. Natural stone and professionally done finishes throughout. Main floor guest suite, separate entry office, large master upstairs. Lower level game rm, wet-bar theater rm, & lots of storage spaces. Gated entry, circular drive with waterscape, outdoor dining, covered decks, sport court, designed fire pit & water sculpture. 4 covered parking spaces. Need To Sell Your House In Sahalee? The Sahalee Country Club is located on the north end of the Sammamish Plateau. The Country Club is a member-owned private club. Sahalee hosted the 1998 PGA Championship and NEC World Golf Championship in 2002. The city of Sammamish rises from the eastern shores of Lake Sammamish, and is nestled between Issaquah and Redmond. In the past 35 years, this suburban community has grown from a population of 6,000 to over 38,000 residents, yet it still retains its rural look and feel. Incorporated in 1999, Sammamish is taking shape as roads, parks, and other city infrastructure are designed and built. This city is conveniently located within easy commuting and shopping distance to many larger cities, including Bellevue, Redmond, and Seattle. The tree-lined streets and well-groomed neighborhoods make it an ideal community in which to raise a family. Sammamish, a "kid-safe, family-friendly community" has one of the highest percentages of children under age 18 in King County. Area children are well served by two distinguished school districts within the city limits: Lake Washington and Issaquah. The Sammamish Youth Board and others promote a variety of organized youth activities. Upscale neighborhoods, like Sahalee with its tight covenants and private security patrols, as well as an assortment of residential neighborhoods are located in and around Sammamish. "The Plateau," as it is commonly referred to, is developing at a dizzying pace as its popularity and land value increases. We are your source for Sammamish real estate and homes for sale, so if you have any questions or would like more information, please contact us using the form below. Let me know what type of home you are looking for in the Sahalee area, and I will be glad to answer your questions, give you a comparative home value analysis, and show you any MLS property listing of interest. Contact me today!